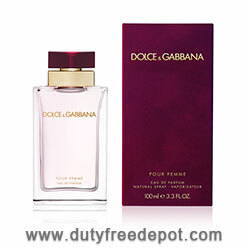 Passionate, sensual and maternal, Dolce Gabbana Pour Femme Eau de Parfum will envelop the senses and linger long after you're gone. Seductive and soothing neroli intertwines with nuances of raspberry over the playful hint of tart green mandarin. Added to a heart of voluptuous sensuality, a softly undulating bouquet of velvety jasmine and citrusy sweet orange blossom. The addictive and sugary guimauve introduces the full-bodied sensuality of the vanilla base notes, and the captivating fragrance is further lit by the roundness of heliotrope and smooth, creamy sandalwood.